In the city of Kyoto, there is an amazing Nishijin textile craftsman who magically weaves the most wonderful Noh costumes, everything from reproductions to new creations. Captivated by the legends of this famous craftsman, our editing staff travelled to meet the master, arriving in Kyoto amidst the colours of autumn. That master is Yasujirō Yamaguchi who turned 104 in 2008. 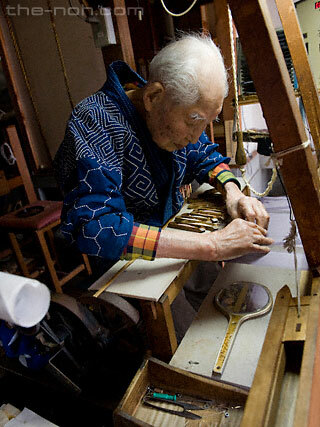 He has cultivated unsurpassed skills in nearly a century as a master of Nishijin textile, reaching the pinnacle of his craft. He became involved almost exclusively in the creation of Noh costumes nearly 50 years ago, and has made nearly 300 pieces. Still active in his craft, he talks to us seated in front of one of his looms. Following Horikawa road north from Kyoto Station, we reach Yasujirō’s workshop in the centre of Nishijin. Before long we feel a mysterious excitement overcome us, and that is when we found the master waiting for us. We finally discovered Yasujirō’s home and workshop, which turned out to be one in a series of shops typical of the Nishijin neighbourhood. Arriving slightly late, we were immediately greeted at the entrance by Yasujirō eldest son, Iwao, and relieved by his kind words. Moving from the entrance to the waiting room, Yasujirō came to meet us. Our eyes were immediately drawn to his extremely long and delicate fingers. His cheeks were ruddy and firm, and his complexion bright. Watching his elegant manner and listening to his sonorous voice, while we knew his age, we wondered if the number “7” weren’t missing as the first digit. He had a refreshing air about him like the main character* in the play Kikujidō. Iwao, who took over the family textile business and supports his father’s Noh costume craft, joined us for the interview. Iwao is himself a practitioner of Noh, and has performed in costumes created by his father. Iwao was the perfect person to join us in explaining the shared path he had and his father had taken. 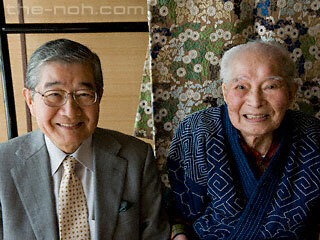 -- In your book**, you say that you first became truly involved in making Noh costumes at the age of 55. Yasujirō : I practiced Noh from around the age of 20 and grew quite fond of it. That is where it all started from. Yasujirō Yamaguchi facing his favourite loom. Actually, there is more to it than that. After the war, thread was impossible to come by, and we couldn’t continue working. I thought of making Noh costumes as a way to continue working, and approached the Ministry of Commerce and Industry about acquiring thread to preserve Japanese culture by bringing back Noh costume making. I then got two responses saying that I would be provided with the thread I required. That’s when I began making costumes. At that time we had to ask the Price Agency to set a price for the thread we wanted to use, but they told us that if we were going to do something this wonderful we could set the price ourselves. Everyone at both the Ministry of Commerce and Industry and the Price Agency was quite happy that I would be making Noh costumes again. Unfortunately, at the time the teachers of Noh couldn’t afford to buy costumes. I had to stop, and instead wove belts to make a living. But shortly after that experience, I was able to start making Noh costumes around 50 years ago. It was around that time that the world began to settle down and the economy began to improve. That is when I decided to bring back traditional Noh costumes using kusakizome dyeing. During the interview, Mr Yamaguchi showed us the catalogue from a one of his exhibitions and samples of costume fabrics. Their beauty was truly breathtaking. -- In creating such wonderful costumes, you must have struggled at first. Yasujirō : One of the first costumes I made was a coloured karaori for a young female role. To bring out a truly red colour, I dyed the fabric in Yamagata Prefecture, a centre of crimson dyeing. I took me three years to get the exact colour of red I wanted. We couldn’t dye in the summer as the materials we used would go bad quickly, so we had to work only in the cold winter. What’s more – it cost us 5 million yen to dye one costume. -- That would make it quite hard to turn a profit. Iwao : With modern chemical dyeing the process takes only a day, but at that time we wanted to challenge ourselves by using the traditional dyeing method and old techniques. Yasujirō : Initially we made five pieces, one of which we donated to the Kyoto National Museum. Iwao : It was used to commemorate the awards ceremony “Modern Great Craftsmen.” I wore one of the five in a performance of Tōboku. -- Do you always wear your father’s costumes when performing Noh? Yasujirō : We decided that I would weave and he would perform. He also took over the business and carried on my hobby, becoming a partner to me. I had my son start practicing Noh in high school with a Kanze school teacher I knew in the neighbourhood. Iwao : He sort of made me go, and I wanted to quit at first, but I stuck with it because many of my friends were studying with me. Before I knew it, I was wearing my father’s costumes to perform Noh. Yasujirō : I would also have him wear new, original costumes I had thought of myself. Noh I old, but with costumes the newer the better. Only wearing older costumes becomes boring. Yasujirō’s job is not only to recreate old Noh costumes – he has also been active in creating new designs, characterized by their lightness and comfort. No performers are required to wear several layers of very heavy costumes and express fierceness, braveness and elegance. The lighter the costume, the easier it is to perform and focus on creating the expressions themselves. Yasujirō’s costumes, which place the needs of the performer first, are praised by the teachers of Noh, and he receives orders from both famous teachers of both the Kanze and Kongoh schools. Yasujirō’s costume making is said to be influenced by the tale of one historical figure. -- How do you see your skills as surpassing those of past craftsmen? Yasujirō : If you look at older costumes, you see that they are woven quite neatly, but that there is something missing. Changing the subject a little, when Toyotomi Hideyoshi was still Tōkichiro Kinoshita, he became a servant of Oda Nobunaga, and his first job was to fetch the lord’s zōri (traditional Japanese straw sandals). When he would fetch the shoes, Tōkichiro would warm them on his chest before giving them to lord Nobunaga. I really like that story, because it shows the importance of taking pride in everything one does. I thought of how I could take the same kind of wholehearted pride in my weaving as Hideyoshi took in his work. Iwao : “Wholeheartedness” is our motto. Yasujirō : In making both obi and Noh costumes, while we use thread which allows the pattern to show clearly enough, we also use the lightest thread possible to make sure the thread doesn’t shift to the inside. We are always thinking of how to weave as lightly as possible, so the thread doesn’t shift to the inside. The weaving is similar to wool weaving, where the front of the thread rises and no extra thread shifts to the inside. Iwao : Female performers often sit while wearing karaori. Master Kiyokazu Kanze has also told us that when they face the waki or the front, it is helpful for the costume to be light. -- I imagine that the modern shitekata are thankful for the practical nature of the costumes. Iwao, what do you think having tried on the costumes? Iwao : Yes, they are quite different. I usually practice in a t-shirt and trousers, and for performances I wear a dōgi, over which I wear a hakunomono and a karaori. Sometimes I will even wear a happi over that, and a kariginu, as in the role of the atoshite in Funabenkei. When you then place a hakama such as a hangirie or ōkuchi over everything, it is really quite heavy (laughingly). In some roles I will then have to wear the costume while swinging a heavy sword such as the naginata. It’s obviously much easier with lighter clothing. -- What was the most difficult order you ever had? Yasujirō : I was from Izumi Mikawa of the Hōshō School. I received an order from both Master Mikawa and Yasuo Imai at the same time. Master Mikawa wanted an original karaori to use in the play Nonomiya. 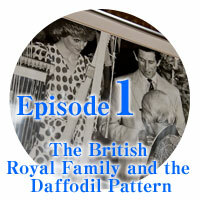 After creating a rough outline of the pattern myself, I had it drawn neatly by a designer and began weaving. I was asked to create a colour scheme that expressed the sadness of a beautiful person having their heart broken. I found this request to be quite difficult. I created a colour scheme rusty red, tea-leaf brown and yellow-green, imagining the colours of autumn. Master Imai wanted me to create a costume for Yuya that was new and comfortable, and helped with posture during the performance. The works of Yasujirō Yamaguchi, the great master of Nishijin textile, have been used not only in domestic performances of Noh, but have also served to introduce the Japanese sense of beauty to areas the world over, including Scandinavia, France and the UK. Many exhibitions have been held and costumes contributed to the museums of each country. -- We have heard that you have contributed Noh costumes to many foreign countries. Yasujirō : We were fortunate to have the opportunity some 20 years ago to hold exhibitions in Swedish National Museum in Stockholm (1984, Showa 59) and The National Museum of Denmark in Copenhagen (1985, Showa 60). I thought that contributing the costumes, which are representative of Japanese textiles, would be a way of sharing the Japanese sense of beauty overseas. Karaori has the meaning of “something of quality,” or a “quality textile.” In the past, anything of excellent quality was known as karamono. In the past, Japanese people greatly prized anything expensive and of high quality that was brought from overseas, and even the type of karaori that was born in Japan was thought to be the best and when called karaori. In this way, the costumes of Noh included the best available techniques from the world of textiles. I wanted to show these to people overseas. Iwao : We held an exhibition in the textile town of Lion, France during the “Japan Week” held there in November of 1999 (Heisei 11). Yasujirō : Before that, at an exhibition held in Kyoto, someone from the French Embassy asked if we would like to hold an exhibition in the Louvre in Paris. I told him that, while the Louvre is the best art museum in the world, we had special ties to Lion. As we owed our success to Lion, I wanted to return the favour. During the Meiji era Nishijin was in decline. 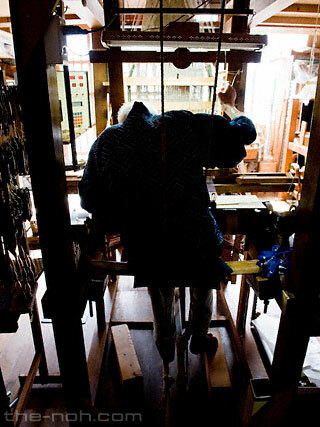 At around that time we sent three craftsmen to study in Lion, and after began Jacquard weaving in Japan. Before that everything was done with hand looms. They required two people, and could make at most 5,000 rows (a measurement of the amount of fabric) a day. With the Jacquard process, only one person was required to operate to loom. 10,000 rows a day could be produced with half the labour costs. When I was younger I would stay up at night working and could do more than 15,000 rows a day – the most I ever did was 40,000. -- That doesn’t seem humanly possible (laughingly). Yasujirō : Because the process became so much more efficient, Nishijin was reborn in a big way. As this was thanks to Lion, I wanted to return the favour and show my thanks first to Lion, and after which if the opportunity came hold an exhibition in Paris also. After that we held the exhibition, and as a token of thanks, I gave to Noh costumes to the museum of history in Lion. Iwao : In the spring of 2002 (Heisei 14), we participated in “Japan 2001,” held in areas around the UK to commemorate 400 years of British-Japanese friendship. We held an exhibition in the Victoria and Albert Museum in London. Yasujirō : I would really like to hold an overseas exhibition every year. -- I would like to take this opportunity to ask any and everyone for their help in planning exhibitions. -- How do you plan to pass on the skills you have acquired? 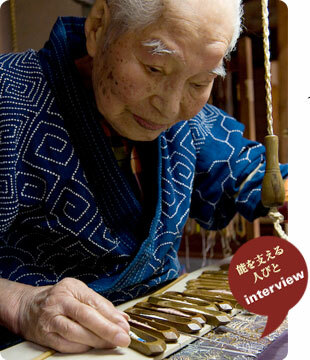 Yasujirō : Since I was 70, every year I have travelled overseas to see the world’s textiles. From this experience, I have come to believe that Japanese textiles are some of the best in the world. And the culmination of the Japanese craft of weaving is Noh costumes. nishiki, shusu, aya, sha and ro, all of these styles are present in Noh Costumes. 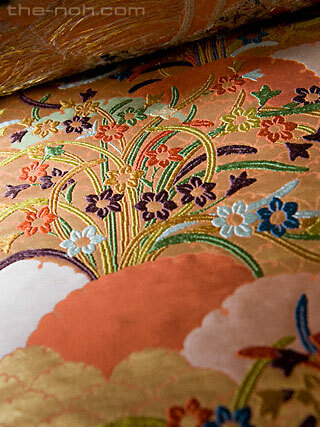 While Nishijin textiles have 1,000 years of history, it is the clothing of Noh that has preserved the craft. Noh costumes have been the lifeblood of Nishijin. I hope to create Noh costumes that will serve as a reference for the Nishijin craftsmen of the next generation. That is the attitude I have taken to my craft. -- Do you think the craft will ever die out? Yasujirō : As long as the Japanese people remain, Nishijin textiles will remain. As long as we don’t die out, I think the craft will survive. Yasujirō has also trained the members of the family business to take over for him. His elder son Iwao and younger son Yutaka will take over the business, and master craftsmen trained directly by Yasujirō will join them. His third Son, Akira, operates the Yamaguchi Noh Costume Research Centre in Saga Prefecture, and is involved with making costumes as well as his own research. Yasujirō : Passing on one’s craft is not one single thing, but made up of many different parts, I believe. My two elder sons will directly take over the business. While my third son worked together with his brothers when he was younger, he now works by himself. Iwao : My younger brother has a strong sense of independence, and likes to try out different things by himself. He is active throughout the world now, spending nearly six months out of the year overseas. Yasujirō : I think he’s doing what he wants to do. Like branches grow from a tree, I believe the craft and its spirit are passed on. 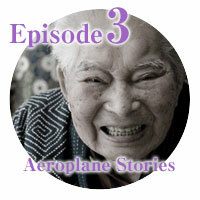 At the end of the interview, Yasujirō said he wanted to live to be 300 or 400 years old. While he has given many costumes both within Japan and overseas, he says he wants to see how different parts of the world change as time passes. We were impressed by his strong desire to learn. When we asked Yasujirō how he would sum up his experience thus far, he said, “I am a humble Nishijin craftsman. I want share with the world the wonder of Japan.” Hearing such words from one of the true master craftsmen of our time and recipient of the Sixth Class of the Order of the Sacred Treasure, we were quite impressed. 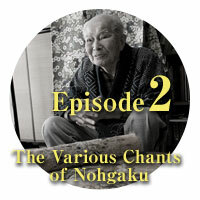 Here we have collected a series of interesting stories from Yasujirō Yamaguchi that we did not have room to share with you in the main interview. Born in Kyoto in 1904 (Meiji 37), after completing elementary school Yasujirō began weaving in the family business. At 27, he started a business making obi (currently Yamaguchi Textile). After the war, he began to receive numerous orders from both the Kanze and Kongoh schools of Noh. In 1978 (Showa 53) Yasujirō received an award from the Ministry of International Trade and Industry for his work as a craftsman in the traditional arts; in 1982 (Showa 57) he received “Modern Great Craftsman” award as a leader in Nishijin textile, and in 1983 (Showa 58), he was awarded the Sixth Class of the Order of the Sacred Treasure. In addition to recreating Noh costumes, he has been active in recreations for the Gion Festival in Kyoto and the Shrine of Ise. When the British royal family visited Japan Yasujirō offered a demonstration of Nishijin weaving and presented the family with Noh costumes as gifts. He has held exhibitions and contributed his works to museums the world over.